The Seventh Judicial District Commission on Judicial Performance, by a unanimous vote (with one member absent and one vacancy), recommends Judge David Scott Westfall BE RETAINED. 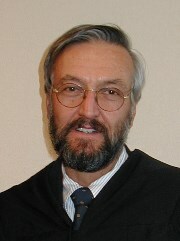 Judge Westfall received an undergraduate degree from Colorado State University and received his law degree from Oklahoma City University School of Law in 1977. Judge Westfall was admitted to the practice of law in Colorado in 1983. Judge Westfall was appointed a County Court Judge in November of 1999. He is board member for the Center for Mental Health and participates on the 7th Judicial District Bond Committee. In addition, he sits as a municipal court judge in Telluride, Ridgway, and Ouray. Judge Westfall avoids potential judicial conflicts with his participation in community functions by making anonymous financial contributions. The Commission observed Judge Westfall in the courtroom, reviewed his decisions, reviewed the survey results, conducted a personal interview, conducted interviews with Chief Judge Patrick, the District Attorney and the Public Defender and reviewed Judge Westfall’s written self-evaluation. Both attorneys and non-attorneys were surveyed regarding Judge Westfall’s performance. Of attorneys responding to the survey, 95% recommended to retain and 6% made no recommendation regarding retention. Of the non-attorneys responding to the survey 75% recommended to retain, 12% not to retain, and 13% made no recommendation regarding retention. (These percentages may not total 100% due to rounding). As a county judge, Judge Westfall handles traffic, misdemeanor and criminal; civil cases under $15,000, small claims and temporary restraining orders. The Commission found Judge Westfall to be confident and respectful to all parties in the courtroom. Overall, the commission unanimously voted to retain Judge Westfall.